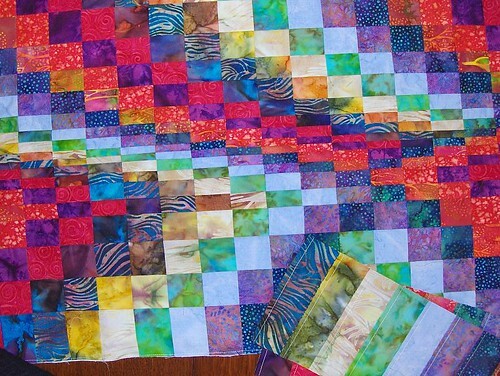 Yesterday my quilting friends and I got together to share our latest projects, drink tea and shoot the breeze. Whereas the most of us were in a winter slump, and didn't make much progress or do practically nothing at all, these past weeks we've picked up the needles and threads and have made up for a hiatus that was a tad too long. 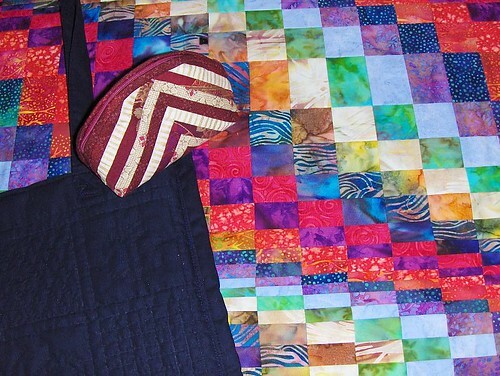 This is the colorful result of Marjo's two-day Bargello workshop. Beautiful, jewel-colored baticks. She wasn't two sentences in her explanation of the process of making such a quilt and my mind was spinning! Pffft! I love detailed, pay-attention-to-what-you're-doing work, but this, this I'm not ready for yet! lol!! Hat's off to you Marjo - this is gorgeous! Here is An's little bag made for a friend at work, Coby's very dark navy blue quilted bag (sorry, that it's impossible to see here, but take my word for it the quilting is beautiful!) and Marjo's Bargello. Finally, An's great progress on a kit we bought together at the European Quilt Championships in Waalre, but I haven't started yet, because of two projects that have time-priority. 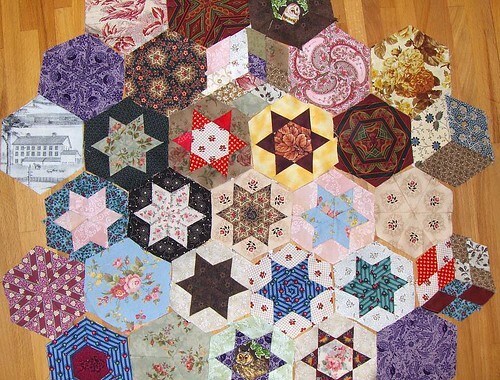 This is a hexagon quilt, a little wall quilt made up of all sorts of reproduction fabrics and Ans' own bits from her stash. Adorable, isn't it? That's it for today - diving back behind the sewing machine!